Dream Theater's fifth studio album, released late in 1999, is widely regarded to be the best album the band has ever released. For me, though, it was a difficult album to learn to enjoy, and in my opinion represents the transition of the band from being great to just good. As soon as it came out, a good friend of mine bought it. He brought it over to my apartment, and I remember that we listened to it together on the big stereo in the living room. We hated it. It took me fifteen years to come to some kind of appreciation of the album. I still consider it a major step down from Awake and Falling Into Infinity, but as time passes I learn to appreciate the fact that musical artists don't stay in one place forever. They grow and develop, and sometimes that means growing into something much different than we listeners grow ourselves. Let me discuss a few of the album's elements in an effort to highlight my complex relationship with this album. First of all, there is a major originality problem on this record. The "story" told through the songs themselves - the lyrical subject matter - draws heavily from the 1991 Kenneth Branaugh / Emma Thompson film Dead Again. Dead Again tells the story of a woman with amnesia whose repressed memories are revealed by a psychologist, through hypnosis. When the repressed memories reveal themselves to be the memories of a past life, the film's peripheral characters become drawn deeper into the story, and their role in the woman's past life, as well as her present life, become known to the audience. It is a highly original story, a double-murder-mystery in the sense that there are two parallel stories happening in the movie - the mystery of her past life, and the mystery of her present life. The story has a series of highly unique and exciting plot twists that I have never seen told in any other story... except the story told in Scenes From A Memory. The fact that the core story and even the major plot twists in Scenes From A Memory are lifted directly from a somewhat obscure movie released eight years earlier makes it clear enough that Dream Theater took their story idea directly from that movie. So what, you ask? Lots of bands, and even classical composers, have written material based on stories written by others. Besides, cinema and music are two different media. Well, if the album's unoriginality ended there, I might indeed overlook it. Unfortunately, musical passages and themes contained throughout the album seem to have been lifted directly from famous music from prior artists in a way that goes beyond allusion or "influence," and feels more like... plagiarism. The reason I think Dream Theater got away with it is because, at the time, they were wearing their influences on their sleeves. In the interviews supporting the release of Falling Into Infinity, for example, Derek Sherinian was quoted as saying "We like to steal very creatively." Indeed, on that album, the "influences" are obvious to the point of discomfort, and slowly discovering these "citations" in their music marked the point at which I started to question the high esteem in which I had previously held them. And let's not forget that Dream Theater's release prior to Falling Into Infinity was an extended player featuring one long song written by Dream Theater and a string of covers written by famous progressive rock artists. That means that after releasing the genuinely great album Awake, Dream Theater went on to release a EP full of covers, an LP full of songs that smacked far too heavily of the source material that "influenced" it, a live album that included even more covers and "homages," and then Scenes From A Memory, whose plagiarism was so blatant that it genuinely shocked me. Just a coincidence, though, right? Fates Warning is known to be one of Dream Theater's major influences - in fact Dream Theater auditioned Fates Warning's original lead singer, John Arch, after Arch left Fates Warning. And since Fates Warning is one of my very favorite bands of all time - the best of the best, in my opinion, of heavy progressive music and artistic vision - this sort of became the final straw for me and my relationship to Dream Theater. No band that takes so much from so many artists so constantly deserved very much of my attention. If I wanted to hear great music, I reasoned, I ought to just go straight to the source material, rather than hearing it secondhand through Dream Theater's reinterpretation. It didn't seem there was an original bone left in the band's collective body of post-Kevin-Moore work. That remained my opinion of the album and the band until sometime in 2012, when I became aware of Mike Portnoy's having left the band. The news was salacious enough for a prog-rock fan like myself, that I couldn't resist diving into the media reports, the band interviews, and, ultimately, the many years of material I hadn't been paying attention to since 1999. When I dive into a band's history, I like to listen to their material in chronological sequence to sort of "get my head into" their artistic development. So when I was reading all these articles, that's exactly what I did for Dream Theater. What I discovered was that, in hindsight, I hated Dream Theater far less than I thought I did. In fact, while I continue to think that Awake is the band's masterpiece, I discovered that all of the band's albums are pretty decent. And there's something else important to say about the band: Love them or hate them, we all have to admit that they have created a sort of "sonic world" we step into as listeners. Even when they're drawing heavily from outside influences, the fact of the matter is that with Dream Theater we know exactly what we're going to get. That's worth something. All that is to say, when I started to restock my Dream Theater CD catalog, Scenes From A Memory was the first item on my shopping list. The first and foremost thing that drew me to the album this time around was James LaBrie's vocals. After years of being panned even by devout Dream Theater fans, I think James LaBrie finally delivered a masterful vocal performance on Scenes From A Memory. This is particularly evident on "Through Her Eyes" [note: Fates Warning released a song called "Through Different Eyes" in 1989]. A slow, moody number, "Through Her Eyes" offers LaBrie enough space to really stretch his voice and show off all the techniques he can't display when he's reaching for high notes. His performance is tender, emotional, and, in my book, perfect. And that just epitomizes for me what he managed to accomplish on this album. Second, there's simply no denying that John Petrucci is a ferocious guitar player. While I am not always a fan of his note choice, on this record he manages to flex his chops without really over-doing it. He solos melodically, for the most part, and saves his technical displays for the instrumental sections of the album that end up being unison lines played not only by him, but also by keyboardist Jordan Rudess and bassist John Myung. 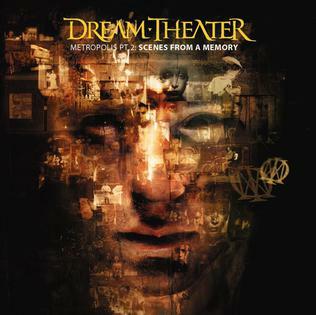 It needs to be mentioned that Scenes From A Memory was Jordan Rudess' first album with Dream Theater, and his influence is evident. This, too, was jarring for me when I heard the album in 1999, because Rudess' playing is much less aggressive and heavy metal than Derek Sherinian's, and a lot less groovy than Kevin Moore's. Instead, it feels playful to me. When the album was released, this bothered me because it felt like the band had become something unpleasant. Through the years, though, I've really come to enjoy Jordan Rudess' playing, and so listening to Scenes From A Memory today gives me a good feeling about the keyboard work. I might not like it as much as the keyboard work on a Planet X album, for example, but I still quite like it. So there you have it: over a decade's worth of history regarding my personal relationship to what others believe to be Dream Theater's masterpiece - why I hated it, why I went back to it, and why I appreciate it today. We all know, of course, that it doesn't ultimately matter what I say about this record. The real Dream Theater fans love it with a fervor that one man's opinion could never - and should never - influence. So if you like the band, and by some shocking stroke of chance, you've never heard this album before, please go ahead and buy it. You'll love it. If you hate the band, I think this album might consist of everything for which you already hate the band. So don't expect this one to change your mind about the band; it probably won't. And if you liked the band's earlier material, but eventually lost interest or stopped keeping up with them, go ahead and give this album a try. You might find, as I did, that it's better today than it was when it came out.